Yield: Serves 4 as a starter, 2 mains. Servings: Serves 4 as a starter, 2 mains. 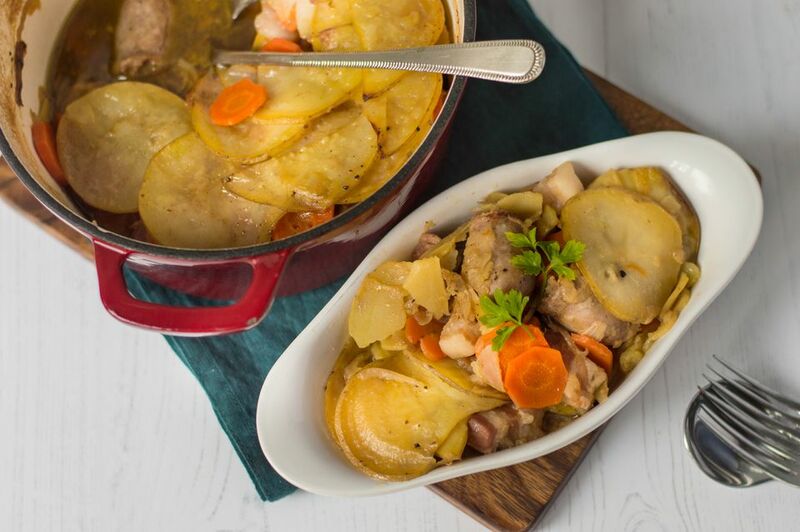 Coddle is a traditional Irish dish usually associated with Dublin and known also as Dublin coddle. It is comfort food of the highest degree; a hearty nutritious stew-like dish made from salty bacon, pork sausages, and potatoes..
Heat the oven to 425 F/220 C/ gas 7. In a large frying pan or skillet, heat the oil. Add the onions and cook over a medium heat for about 4 minutes. Cut the bacon piece into 1/2-inch cubes. Add the bacon to the onions and stir well. Cut the sausages in half and add these to the onion and bacon. Raise the heat and, constantly stirring, cook until the sausages start to brown. Take care not to burn the onions. In a heat proof casserole, place a layer of the onion, bacon, and sausage mixture followed by the layer of sliced carrots and then a layer of potato. Season with salt and pepper. Repeat the layering until used up, finishing with a layer of potato. Carefully pour over the stock. Cover with a lid or a double layer of aluminum foil. Place in the center of the oven and cook for 45 minutes. Take a peek to make sure the coddle isn't drying out (if necessary top up with a little boiling water but don't flood the stew). Lower the heat to 350 F/175 C/gas 4 and cook for a further 30 minutes, until bubbling and the potatoes are thoroughly cooked. Serve with hefty slices of Irish soda bread and butter, to soak up all the lovely juices in the dish, as is the Irish way, and enjoy! Where Does the Name Dublin Coddle Come From?